Oh how I’ve missed you! I’m so sorry to keep this recipe away from you for so long! Recently I was traveling up to Washington and then back to Portland to visit my dear sister and, of course, for the World Naked Bike Ride! Like always, great fun! In Washington, my mom and I ate lunch at a fantastic restaurant in Lake Stevens called The Ringing Cedar Tea Tavern. Holy poop was that lunch amazing. AND they had a durian smoothie! We ate vegan tacos with BBQ jackfruit, peach mango habanero salsa, cashew cream and oh, so much more. Plus raw banana coconut cream pie for dessert. Rich and delicious. I have no reason to drive all the way to Lake Stevens other than for that restaurant but I WILL GO. So good. Eat there. Foodgasms for all. Amen. Secondly, but not at all secondary…I went to my favorite eat spots in Portland: Blossoming Lotus – Live Tacos with pecan chorizo, Pb&J smoothie made with mixed berries, figs, banana, peanut butter, cinnamon, coconut water; The Whole Bowl – Vegan Bowl made with brown rice, red and black beans, fresh avocado, salsa, black olives, cilantro and the magic Tali Sauce; Laughing Planet (I give my sister full credit for ordering this for me, I don’t know my way around a menu where you have to add things yourself, far too complicated for me) – Che Burrito in a bowl, vegan deluxe, add tempeh. Don’t ask, just order it. Next up, I’m working on a new page for this blog that will include my favorite vegan spots all over the world, there are just so many places that sometimes you need a list to keep track. Let me know what are your favorite raw and/or vegan spots in the world! I have a few more weeks on this coast then I’m back on the road and always looking for new spots for a good meal. And finally, let’s get down to it! This was my first go at making vegan ice cream cookies. I’ve never been a huge fan of ice cream cookies because the act of biting into ice cream sounds like something I would want to avoid. These turned out to be ridiculously delicious. It was actually surprising. 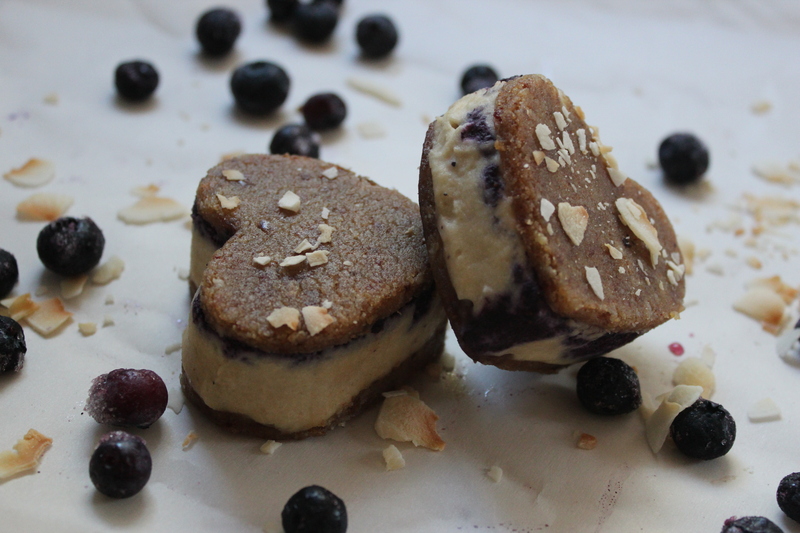 Plus it’s 41 degrees here (107 F), who can say “no” to a delicious cookie filled with cold marzipan cashew cream and blueberry sorbet when you are lying under a fan in a pool of your own sweat? 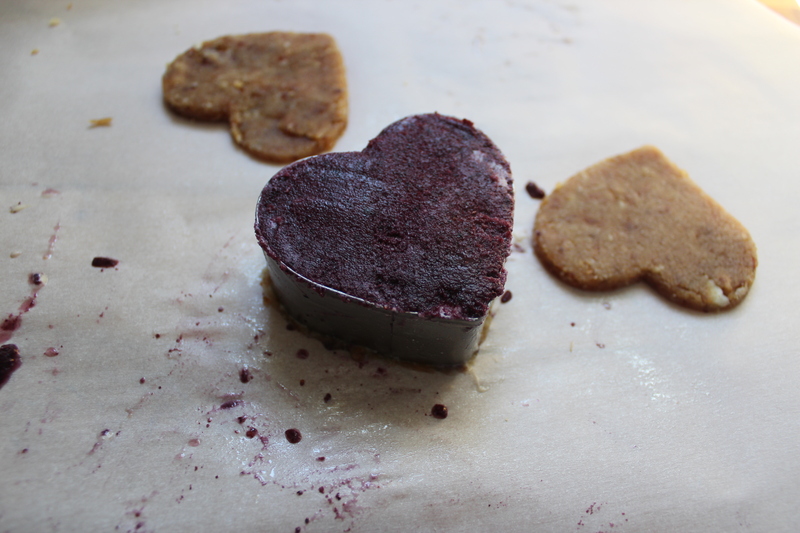 To make the cookie dough: blend dates and brazil nuts together until well combined, without any large chunks. Stir in the almond flour, vanilla, salt and nutmeg. Take a large piece of the cookie dough and place it between two sheets of wax paper. Roll it flat with a rolling pin, bottle, or whatever works for you. Be careful not to make them too thin (they should be at least 2 or 3 cm thick). Lift off the first sheet of wax paper and cut into shapes using a cookie cutter. I chose hearts! The more simple shapes are better…I once tried to get fancy with the cookie cutters and it did not work out well for anyone involved. Continue rolling, and cutting out shapes until you’ve gone through all of the dough, then put them on a plate in the freezer. To make the marzipan cream: strain and rinse the soaked cashews. Blend cashews, sweetener, non-dairy milk, almond extract, lemon juice, vanilla and salt together until smooth and creamy. Put in a bowl or container and place in the freezer. 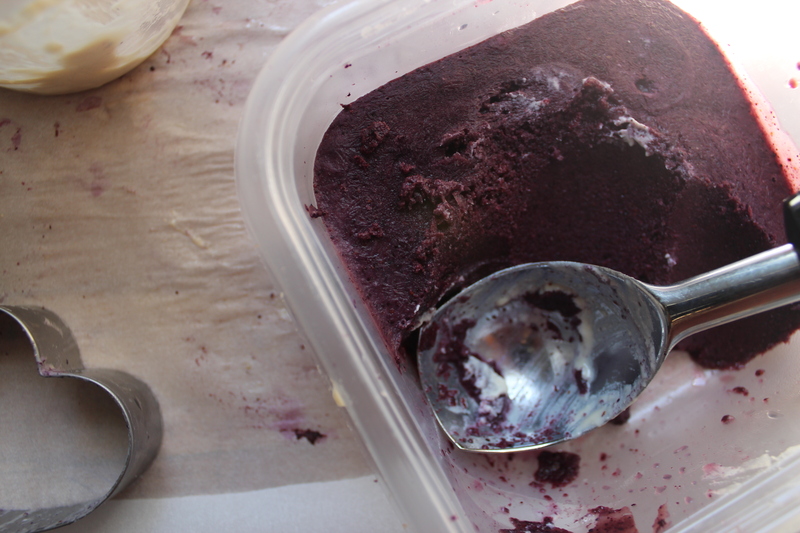 To make the blueberry sorbet: add blueberries, coconut milk, maple syrup and lemon juice to the blender and blend away! Pour into a container and freeze it! 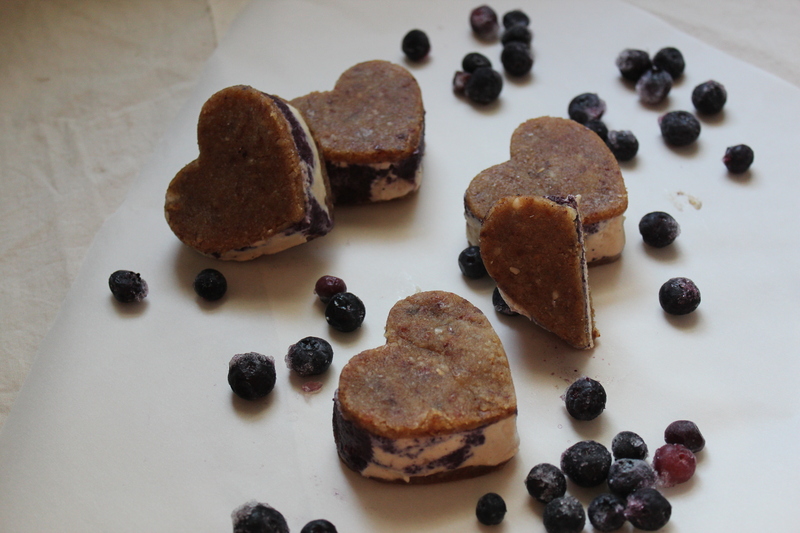 The cashew cream and blueberry sorbet will take a while to freeze, up to several hours depending on your freezer. I just let mine freeze overnight. You want both the sorbet and the cashew cream to be pretty solid but still scoopable. 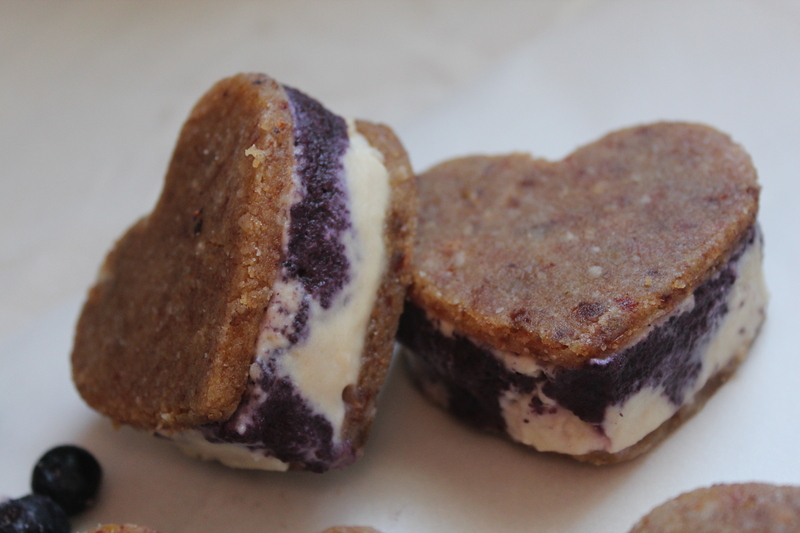 Okay here’s the slightly-difficult-to-explain-but-not-that-hard-to-do part: once your marzipan cashew cream and blueberry sorbet are both frozen, take the cookies out of the freezer and place your cookie cutter around one as if you had just cut it. Scoop out a spoonful of marzipan cream and put it on top of the cookie inside the cookie cutter. Do the same with the blueberry sorbet and press down with a knife. Do this until you reach the top of the cookie cutter. Make sure to really press the cream and sorbet down so they fill the cookie cutter mold completely. Place another cookie on top of the cream/sorbet and slowly push your ice cream cookie out of the cookie cutter. 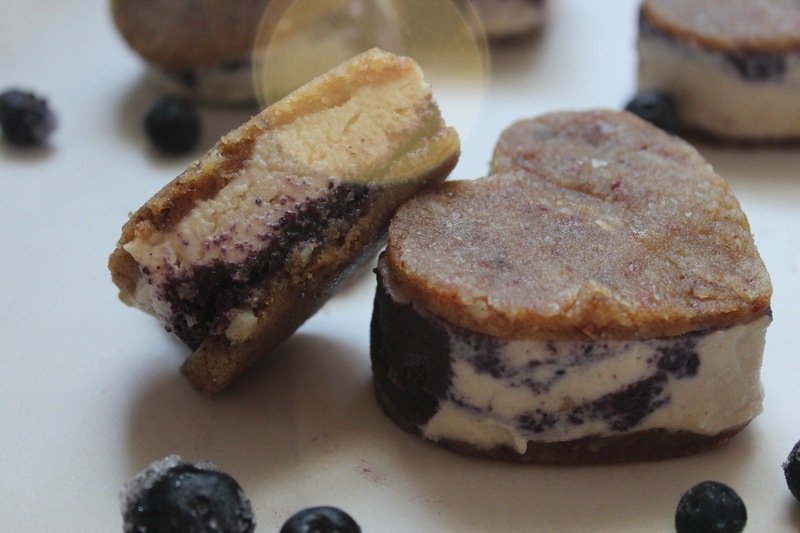 You should end up with a swirl of blueberry sorbet and marzipan cream sandwiched between two cookies. 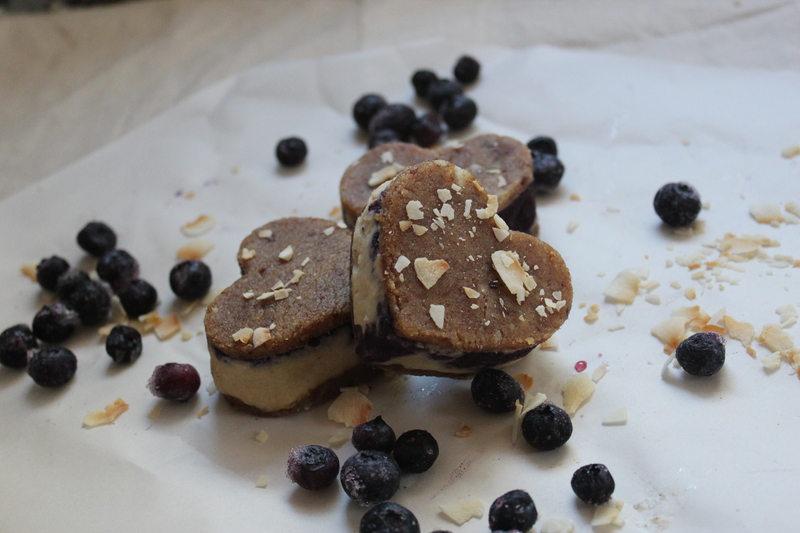 When you finish put the cookie in the freezer or….eat it! These treats are so delicious they don’t stick around long! Kick back in the sunshine and enjoy with love! maker of things. lover of food. it is amazing how much dates help with these recipes! Yes, dates are divine and make just about everything extra delicious. 🙂 Your blog looks beautiful – I’m looking forward to trying out that Cinnamon Spaghetti. much love!